Dark chocolate has long been the favorite child of pastry chefs and gourmands, but a good milk chocolate cake is hard to find. 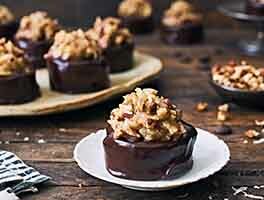 We've created this recipe for those who crave the lighter taste and creaminess of milk chocolate. The ganache that serves for the filling and icing is truly luscious. All you'll need to finish is a big glass of ice cold milk! 25 mins. to 50 mins. For the ganache: Place the chopped chocolate in a medium-sized bowl. Heat the cream until just boiling and pour over the chocolate. Slowly stir until completely melted and lump-free. Set the bowl in the fridge to chill while you make the cake. Preheat the oven to 350°F and prepare your chosen pan(s) by spritzing well with cooking spray. For the cake: Place the oil, butter, sugar, and eggs in the bowl of your mixer. Beat on medium speed for 2 minutes. Stop the mixer and scrape down the bowl. Add the melted milk chocolate, salt, flour, Cake Enhancer, baking soda, vanilla, dried whole milk, cocoa powder and 1/2 cup of the buttermilk. Beat on medium speed for 1 minute. Stop again and scrape the bowl. Add the remaining buttermilk and beat for 30 seconds. Pour the batter into the pan(s), and bake: for 8" rounds, 18 to 24 minutes; for 9" rounds, 20 to 28 minutes; for cupcakes, 15 to 18 minutes. For a 13" x 9" x 2" pan, bake 25 to 35 minutes. The cake is done when a toothpick inserted into the center comes out clean, with just a few moist crumbs. Rest the cake in the pan for 10 minutes, then turn out onto a rack to cool completely. 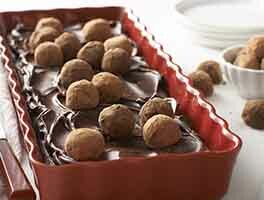 To prepare the ganache: The chilled ganache should now be the consistency of chocolate pudding. Place it in the bowl of your mixer and whip with the whisk attachment until thick, light, and fluffy. Be sure to scrape the bottom of the bowl to fully incorporate all of the chocolate. 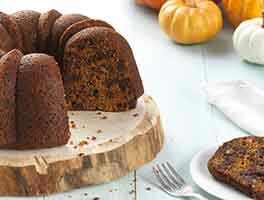 To assemble the cake: Using a long serrated knife, divide each cake round into two layers. 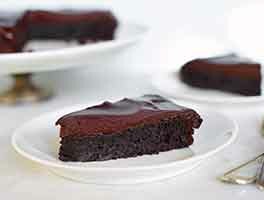 Place one layer on your serving plate and spread with a 1/2"-thick layer of the whipped ganache. Add another layer of cake. If you're using Marshmallow Fluff for filling, pipe a ring of ganache around the top of the second layer as a border, then fill it with 3/4 to 1 cup Fluff. The border of ganache will keep the marshmallow from oozing out the sides of the cake. Add another layer of cake, another layer of ganache, and the final layer of cake. Ice the rest of the cake with the remaining ganache. Serve at room temperature; refrigerate any leftovers, well-wrapped, for up to 5 days. Yield: one 8" or 9" layer cake; or one 9" x 13" sheet cake; or 24 cupcakes. No dried whole milk in the house? You can eliminate the dried whole milk and the cocoa in the cake, and use 1/2 cup instant hot chocolate mix (milk chocolate flavor) instead. Don't care for Marshmallow Fluff? 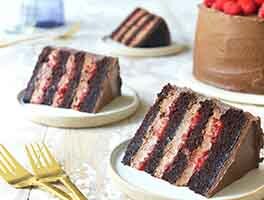 You can fill the center of the cake with another filling of your choice, or use all ganache if you choose. While it's optional, soaking your layers in simple syrup will add moisture and flavor to your cake. Just brush 2 tablespoons simple syrup over each layer and let it soak in for 5 minutes before layering. I made the cake as directed and it was good. I made this cake a second time with coffee frosting as my daughter requested. It was awesome! Both times I made this cake my three member family finished it in three days each time. For that reason I cannot make this too often. My daughter also loves the monkeying around bread from this site! This was a disaster ...Even with piping a ring between the layer to keep the mallow in- it seeps out all over, cake is lopsided and oozing-sliding. Messy and not pretty at all. I was gonna give this a a thank you to a friend but now ill be keeping it. My rating is based on the assembly and looks of the cake... haven't tasted yet but will let you know when we do. I don't have a clue why cake languishes in our home but cupcakes disappear within 24 hours! :) Perhaps portability? Or the frosting/cake ratio? Whatever the reasons, when I'm not baking a cake for an event, cupcakes are the way to go in our home. I deeply appreciate that for cake recipes, K.A. goes that extra step and posts yields on cupcakes. Thank You! I've never made a Milk Chocolate cake so I was excited to try this one out. (My default chocolate cake is Hershey's Dark Chocolate Cake.) The photos shown in the step-by-step process were incredible! 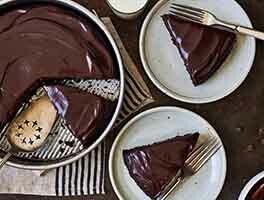 I've never made a ganache and the photos made the process very simple. Since I made jumbo cupcakes, I was able to use King Arthur's wicked-cool cupcake corer, and that's where I placed the Marshmallow Fluff FROSTING. Yes, FROSTING rather than straight Fluff. I find Fluff taken right from the jar absolutely impossible to handle and it sticks on many people's dentures or implants, so I take the time to make the double-boiler Fluff frosting. I then frosted them with the ganache and had heart-shaped sprinkles on top of that. You should have seen the smiles from the folks who got these cupcakes...it was worth every single second of making and baking them. :) As always, King Arthur, I bow down to you and your recipes, products and helpfulness! Here's a <3 for you!